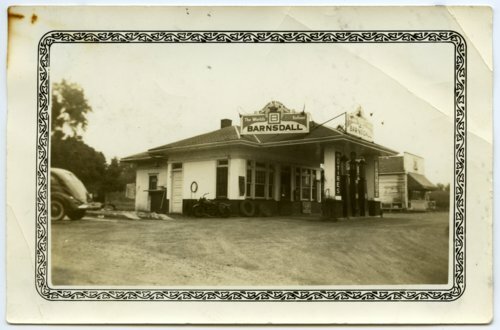 This photograph shows the service station operated by A. L. (Vern) Coffman on the southeast corner of California and 10th streets in Topeka, Kansas. Coffman ran the station from the mid-1930s until his death in 1963. Called Pooch by his friends, Coffman was well-known in Topeka's baseball community as the manager of the Topeka Decker Oilers semi-pro team in the late 1940s and 1950s. During that period, the Decker Oiler team was a perennial contender for the state semi-pro baseball title, competing each year in the state tournament in Wichita. The team won the state championship in 1948, placed second in three consecutive years (1950-1952), and finished third in 1955 and 1957. Other Coffman family members were key members of the Decker Oiler team, including Vern's brothers Ed and Junior, and his sons Harland and Burton. The team's practice field was located just to the south of the service station shown in this photograph. Digital reproduction of the photograph was accomplished through a joint project sponsored by the Kansas Historical Society and the Shawnee County Baseball Hall of Fame.